Magellan Triton 1500 handheld GPS system is amazingly easy-to-use, with simple menus, instant access buttons, intuitive scroll pad and crystal clear graphics on a large 2.7-inch full colour touch screen display. The Magellan Triton 1500 includes powerful torch, voice recorder, digital music player and a pre-loaded basemap of Europe and worldwide geographic boundaries. The Magellan Triton 1500 is powered via two AA batteries providing up to 10 hours battery life. Rugged and waterproof, the Magellan Triton 1500 is built to withstand intense use, accidental impact and immersion in one metre of water for up to 30 minutes (IPX-7). It's ready to guide you on any adventure. Accessories, spares and parts are still available for your Triton 1500, as are TOPO maps. 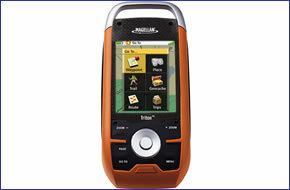 The Magellan Triton 1500 gives you a full color 2.7-inch screen, a built-in European basemap database and, the essential easy-to-use navigation features, making it an unmatched value in its class. Magellan Triton 1500 is amazingly easy to use with a smartly designed interface and simple menus that make navigation fun and effortless. The full-color crystal clear display shows all your maps and navigation information in brilliant, easy-to-view graphics. Quickly view all your maps, locations and saved tracks and waypoints using the intuitive user interface and direct-access buttons. Unlike complicated devices that require you to scroll through screen after screen, Triton 1500 gets you to the information you want in two or three clicks. Magellan Triton 1500 is designed for precision navigation, offering the fastest GPS positioning acquisition in the industry with the SiRFstarIII chipset. An integrated high-sensitivity antenna provides reliable signal reception even in heavy cloud cover, valleys or deep woods. Built-in signal augmentation reception (EGNOS) provides between 3-5 metre accuracy. Touch-screen technology makes it easy to use all the advanced features. View the elevation profile for the trial ahead (or any route) or even the track you just traveled. See the precise time of sunrise/sunset any day of the year. Get a calculation of the best hunting and fishing time. And much more. Rugged and waterproof, the Magellan Triton 1500 is built to withstand intense use, accidental impact and immersion in one metre of water for up to 30 minutes (IPX-7). It's ready to guide you on any adventure. Flashlight - Light your way with a powerful LED flashlight. Low power consumption helps maximize battery life. Voice recorder - Microphone and speaker enable you to record audio notes for waypoints to share with friends and family or easily find your way back next time. Audio jack - Plug in any standard 1/8" headphones to enjoy clear private listening of your digital music, voice notes and other recordings. Record audio notes for waypoints and play them back with the built-in microphone and speaker. A powerful, low battery consumption LED flashlight helps you find your way in the dark: an invaluable tool for camping and other outdoor recreation. Do you have a question about the Magellan Triton 1500 or other handheld GPS related question that's not been answered on this webpage? Please see our handheld and Outdoor GPS FAQs page for questions from other customers.Plus if the answer to your question isn't featured, use the online form to ask us for the answer. Alternatively please telephone 01733 777623 Monday to Friday (9:30am-5:00pm) to speak to one of our sales team. Magellan Triton 1500 is pre-loaded with European basemap and includes the following countries: Austria, Belgium, Switzerland, the United Kingdom, Ireland, France, Germany, Italy, Spain, Portugal, Luxembourg, the Netherlands, Norway, Sweden, Denmark, Finland. The Magellan Triton 1500 also includes worldwide geographic boundaries. Looking for accessories and spares for the Magellan Triton 1500? Many parts are available including a carrying case, vehicle power cable, vehicle mount and external GPS antenna. Add TOPO maps of Great Britain to the Magellan Triton 1500. Available regions include TOO The Midlands and TOPO Southern England.